Yunnan is perhaps best known for its black and Pu-erh tea, but green tea is also worthy of note - such as this beautifully made silver tip variety, the flavor is full, rich and distinctively fruity. This tea is appeals to both green tea connoisseurs and novices. PREPARATION: To prepare Yunnan Silver Tip Green tea we recommend either a regular teapot or individual steeping cups. Allow 1 to 2 tsp. of tea leaves per serving. Cover with water no hotter than 70°C, (158°F) and allow to steep for 2 to 3 minutes depending on desired strength. 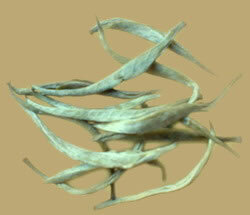 Silver Tip Green tea generally may be resteeped 2-3 times.